These three London pasta bars are feeding our ongoing obsession with the Italian staple. They’re inexpensive, informal and perfect for a quick meal, with no compromise on taste. 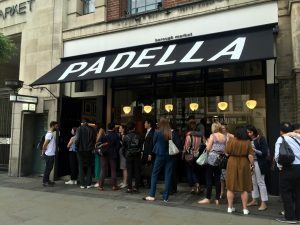 This award-winning Borough Market pasta bar could be credited as the first of its kind in London. From the owners of Islington’s famous Italian restaurant Trullo, their dream was to serve fresh, hand rolled pastas inspired by regular trips to Italy, in an informal bar setting. The service is quick, the vibe is busy and fun. Solo diners can sit at the marble bar looking out over Borough High Street or if you’re more than one, there’s table seating with room for burratas or radicchio salad and other antipasti sharing plates. A short, seasonal menu shows strong regional Italian influences and their most famous Cacio Pepe is definitely worth the journey, as is the succulent 8-hour Dexter beef ragu. A slice of lemon tart or a scoop of icecream and an espresso keeps the pudding list authentic, the meal fast and with most dishes around £6, it’s a pretty economical lunch. 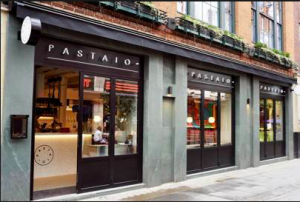 Tucked away off Carnaby st, in the heart of a buzzing restaurant community, Pastaio stands out as a superior new entry. Bold terrazzo marble bars, for communal seating, and a eye catching mural, show that as much care has gone into the stylish decoration as the ingredients. All the fresh pasta is made by hand on site: if you glance through the street level window before lunch time, you’ll see the chefs rolling tagliatelle or stuffing ravioli for the day’s service. The frequently updated, seasonal pasta menu ranges from courgette and smoked ricotta conchiglietteto fresh crab, chilli, with black and white spaghetti (and optional bottarga), which tops the price list at £11. A choice of 6 or so antipasti includes a refreshing watermelon, cherry tomato, and feta salad or their signature mozzarella, n’duja (Calabrian spicy pork sausage) and honey sandwich. The clementine sorbet or pistachio icecream is a must for dessert, or the tiramisu if you’re settled in for a bigger meal. 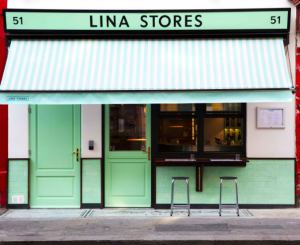 The Lina Stores delicatessen on Brewer st has been making fresh pasta and selling Italian imported ingredients in Soho since 1944. Their new two-floor restaurant, in a narrow Greek street townhouse, is now serving the same excellent fresh pastas and cakes made daily in their shop. Decorated in its trademark pistachio colour with a bustling, clattering atmosphere, there are reservations available for lunch and early dinner. The short menu offers some more substantial dishes for those who want a full dinner experience: starters include aubergine polpette or a slow roasted pork sandwich. The trademark raviolis, gnudis and gnocchis come with the classic sauces of meat ragus; ricotta or brown butter and sage, keeping them rooted in authenticity. There is a more plentiful pudding list, including Sicilian specialty whipped ricotta Cannolo and an Amarena cherry and almond tart.